TOKYO (WBSC) – The World Baseball Softball Confederation (WBSC) concluded a two-day interview from 7-8 Aug. with Tokyo 2020 Olympic Games organisers to outline the viability and potential value added to the Tokyo 2020 Games with baseball and softball – Japan’s national sport – included. WBSC President Riccardo Fraccari led a seven-person baseball/softball delegation in Tokyo that included home run king and sports legend Sadaharu Oh and Nippon Professional Baseball (NPB) chief Katsuhhiko Kumazaki. NPB, Japan’s most popular sports league and WBSC Member, attracted more than 23 million spectators in 2014, the second-highest recorded attendance of any sports league in the world in 2014. Oh joined the WBSC delegation following his throwing out of the ceremonial first pitch on 6 Aug. that commemorated the 100th anniversary of Japan's annual "Koshien" National High School Baseball Championship -- the legendary two-week youth tournament that fills the 48,000-seat Hanshin Stadium and is televised nationally. Also part of the delegation from WBSC leadership was Secretary General Ms. Beng Choo Low, Softball Vice President Dale McMann, Japan Softball Vice President Ms. Taeko Utsugi, Athlete Representative and 2008 softball Olympian, Ms. Maria Soto. Baseball/softball is one of eight new sports being considered by Tokyo 2020 following Olympic Agenda 2020’s landmark ruling last December that allows Olympic hosts to propose adding sports that are not currently on the Olympic programme but that are popular in the host nation and could enhance the appeal of the Games. The top sport in Japan in terms of youth participation, infrastructure, media coverage and fan-following, baseball and softball are played by an estimated 65 million men and women athletes in over 140 countries worldwide. “Given our sport's footprint in Japan and worldwide, WBSC and our global partners hoped to have shown during the interview in Tokyo that staging Olympic baseball and softball in 2020 would be easily accommodated -- fully in the spirit of Olympic Agenda 2020 -- and the added value as well as the historic value would be a ‘home run’ for Tokyo 2020, the Olympic Movement and our sport,” said President Fraccari. 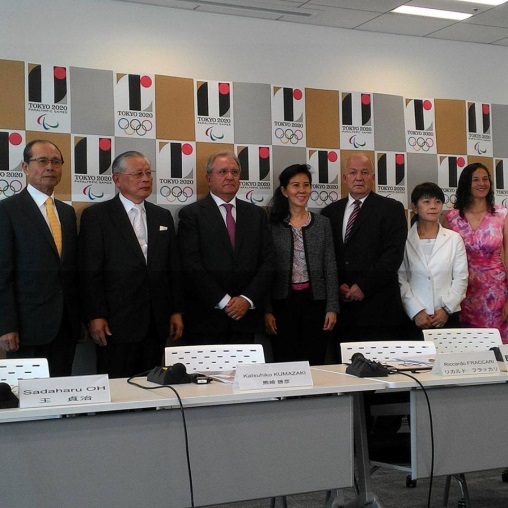 Tokyo 2020 is expected to announce a proposal for additional event(s) by 30 September 2015. The final decision on the composition of the Tokyo 2020 Olympic sports programme will be taken by the 129th IOC Session in Rio de Janeiro in August 2016. WBSC's organisational structure and reach consists of 212 National Federations and Associate Members, inlcluding professional leagues, across 141 countries and territories worldwide.